UTSA students housed in the First-Generation Living and Learning Community will be paired with a peer mentor and faculty coach. (Aug. 10, 2018) -- When more than 4,000 UTSA students arrive on campus next week to move into their residence halls, most will be living away from home for the first time. And for most of the first-generation students showing up at Move-In Weekend, it will be the first time anyone in their family has experienced living on a college campus. UTSA is making the transition from home life to college life more comfortable for these new students with a First-Generation Living and Learning Community. The new residence hall learning community, located in Alvarez Hall, will house 40 first-generation students. Two first-generation residence hall assistants will lead the students. 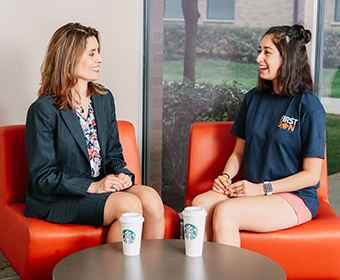 A first-gen peer mentor and a faculty coach who was also a first-generation college student will guide them on their academic journey and foster the diverse community at UTSA. At UTSA, nearly half (45 percent) of the undergraduate student population is first-generation, and they often are not aware of the resources and opportunities available to them at a university. To cultivate an exceptional student experience, the First-Gen and Transfer Center will provide many resources to the students throughout the year that go beyond the classroom and campus. Special programming for the first-gen wing will ensure the students achieve success with awareness of the assets offered to them at UTSA. The wing also allows the students to bond through their special connection of being the first in their families on a path to graduate from college. “Our goal is to create a positive and welcoming community, which we know our first-gen residents will feel from the moment they move in,” said Em de la Rosa, UTSA associate director of Residence Life and Education. The first-gen students, and thousands more Roadrunners will move in to their residence halls at UTSA on Friday, Aug. 17 and Saturday, Aug. 18 during Roadrunner Days, marking the beginning of the 2018-19 academic year. Learn more about the UTSA First-Gen and Transfer Center. Learn more about UTSA Special Interest Housing.